SUMMARY: Fan the flames: A teen goddess fires up her search for love and family in this sequel to Wildefire.Ashline Wilde may have needed school to learn that she is actually a reincarnated goddess, but she’s ready to move beyond books. She leaves her California boarding school behind and makes for Miami, where she meets a new group of deities and desperately seeks her sister Rose, the goddess of war. But she’s also looking for love—because even though her romance with Cole had to be snuffed, Ash is a volcano goddess—and she doesn’t get burned. 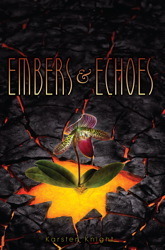 Intense, fun, and heartbreaking, Embers and Echoes mixes all my favorite things into one stellar book. From amazing characters to a twisty and mindblowing plot to fabulous and gorgeous writing, Knight most definitely continues to wow me. Holding nothing back, and letting readers know that, truly, no character is safe, Embers and Echoes continues an already wowing series with the same level of talent. Ashline is awesome, a girl who is fierce, determined, but also a little bit broken. Not completely unaffected by things, but willing to fight back no matter what, she is that right blend of healthy fear and take on the world. Witty and quick with the comebacks, she will keep readers both entertained and entranced. The events of book one have definitely had an effect on her, and it shows easily, but Knight does a remarkable job of not only building her beyond that, but letting it strengthen her as well. Wes is a new character to this book, but a memorable and awesome one. Presenting Ash with not only new challenges but opportunities as well, and a charm and wit to him that made me fall for him, he has a big role in this book, yet never takes the light away from Ash. Along with Wes comes a girl named Aurora, who is both intriguing and alluring. The friendship Ash forms with these two is potent, and has its own playout that is both stunning and wrenching. Then, of course, there’s Colt, a guy who most certainly will leave readers even more twisted than in book one. Sure, he's basically a jerk, yet I admittedly admire his determination and loyalty, not to mention Knight gives quite a few looks into not only his past but Ash's as well, giving great reasons for his behaviors. As with Ash, Knight has a knack for building all of his characters, making each one stand out in their own way, and developing them throughout the book and series. Thanks for the review-I think this is the first one I've seen and I was definitely curious about it after really enjoying the first book and being shocked by that cliffhanger!